Need a break from your plugged-in, app-filled life? A visit to the largest living history museum in the nation may be the perfect place to gain some perspective on the 21st Century. Colonial Williamsburg, once the colonial capital of Virginia, remains largely as it was in 1776. 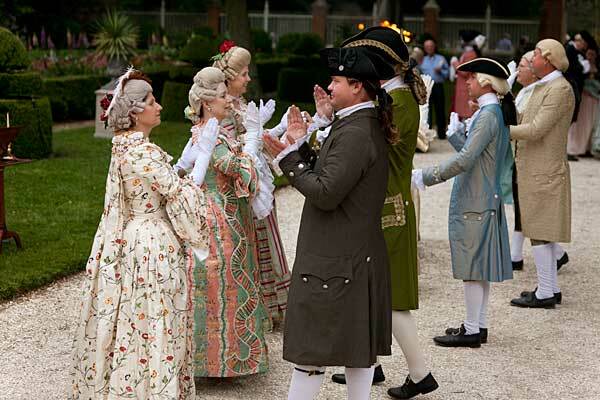 Roam the cobblestone streets and mingle with costumed interpreters who speak, dress and behave in a manner that is immersed in the 18th century. For all of its authenticity, Virginia’s Historic Triangle offers a very modern concept in public transportation, a free shuttle bus. 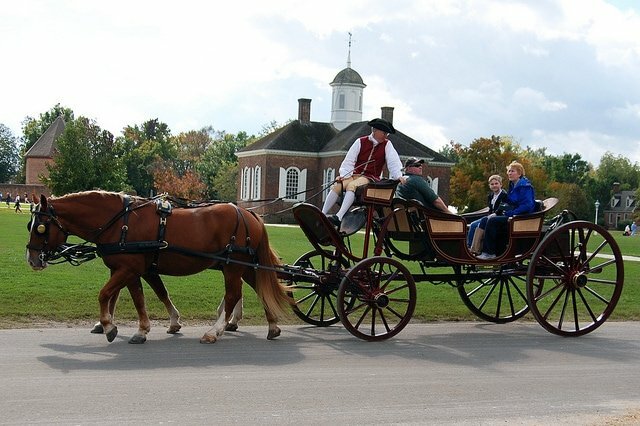 From March until November, the shuttle runs every 30 minutes and will get you from Colonial Williamsburg to Jamestown, the first English colony in North America as well as to the Yorktown Battlefield. With an Amtrak station in the middle of town, immersing yourself in history has never been easier. Meticulously reconstructed and restored to look exactly as it did in the 1770’s, this is the heart of any visit to the region. To keep it real, no cars are allowed, though you will see horse-drawn carriages. The 30-minute orientation walk is a good way to get your bearings. It leaves from the Gateway Building, just behind the Governor’s Palace. As you get acquainted with the town, you will see scores of re-enactors going about their daily lives just as they would have in the 18th century. To get a glimpse into the colonial justice system, visit the Courthouse, an imposing original structure that dominates Market Square. You will have the opportunity to sit on a jury and see the whipping post and stocks where offenders were subject to public ridicule. Another must-see is the nobly proportioned Governor’s Palace with its spectacular formal gardens that include a maze. Dozens of craft demos occur daily and include cooking, basket weaving, wig making, bookbinding and blacksmithing, all done by highly skilled, costumed craftspeople. They explain their trade as they work and encourage questions. Purchase your tickets at the Colonial Williamsburg Regional Visitor’s Center, and you will have unlimited access to the dozens of historic buildings and museums. There is no cost if you just want to stroll the Historic Area. 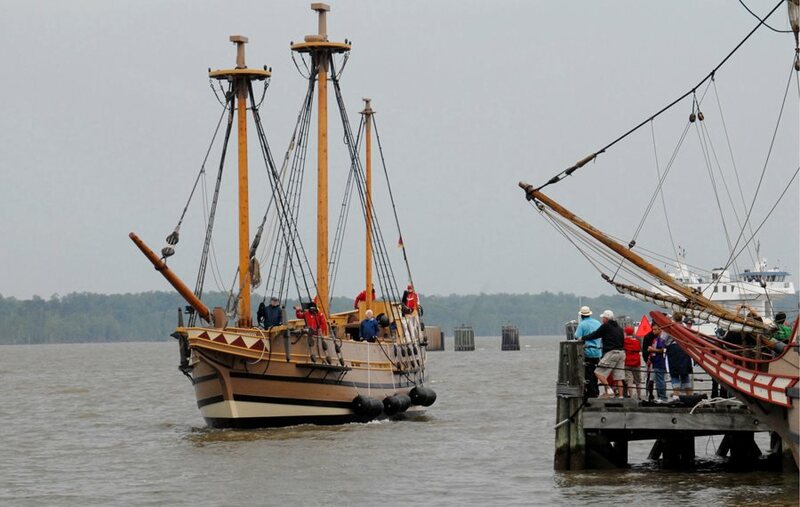 If you are planning to visit Jamestown and Yorktown, there are convenient price options that include these sites. If your thespian side needs to shine, rent a colonial costume at the Visitor’s Center. Adjacent to the Historic Area of Colonial Williamsburg, history buffs will get a kick out of visiting the campus, founded in 1693. William and Mary is the second oldest college in the U.S. (Harvard is the oldest). You can trace the steps of Presidents Washington, Jefferson, Monroe and Tyler who all got degrees or licenses here. The Sir Christopher Wren Building was constructed in the 1690’s, and it houses an informative exhibit regarding its own history. 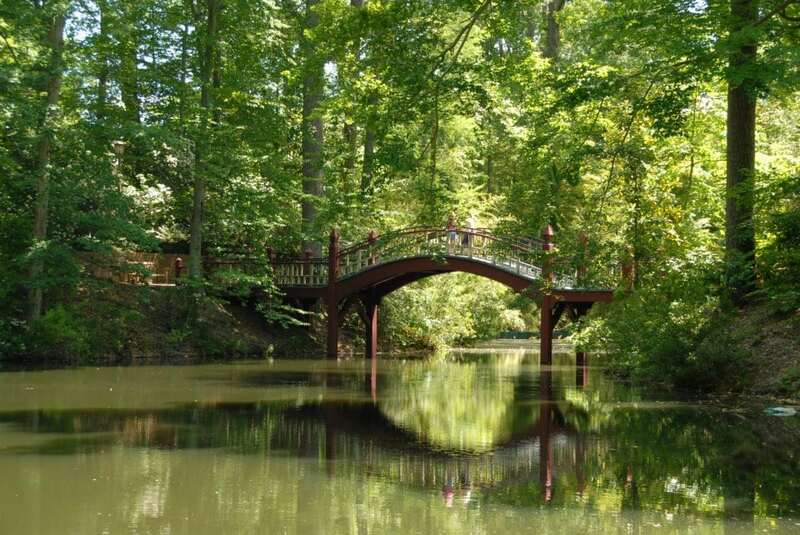 If romance is more your style, the Crim Dell Bridge has been repeatedly voted the most romantic spot on any college campus. The glorious lakeside flora, fauna and whimsical bronze statues make it a perfect picnic spot. Just a nine-mile shuttle bus ride or easy bike ride down the scenic Colonial Parkway is the Jamestown Settlement. This living history museum presents a comprehensive look at the colonist’s struggles dating back to 1607. There is a re-created Powhatan Indian Village with costumed re-enactors demonstrating how the indigenous people hunted, farmed and fished. You may climb aboard replicas of the three ships that transported the original settlers across the Atlantic. If you want to see the actual site where the settlers first arrived, head over to Historic Jamestowne, located next door. The Yorktown Battlefield, also located off the Colonial Parkway, is the site of the final major clash of the American Revolution. The British surrendered to General George Washington here in 1781, ending the war and granting the U.S. independence. After you’ve bathed in military history, head over to Riverwalk Landing. 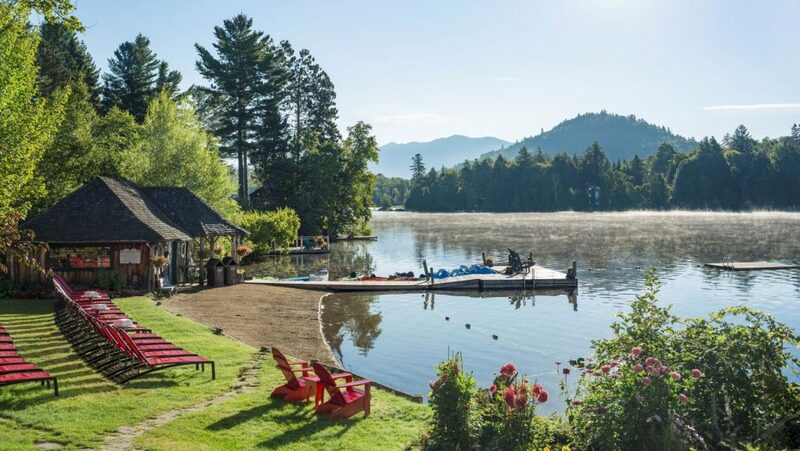 It is on the waterfront and full of charming antique shops, restaurants and art galleries. 1. 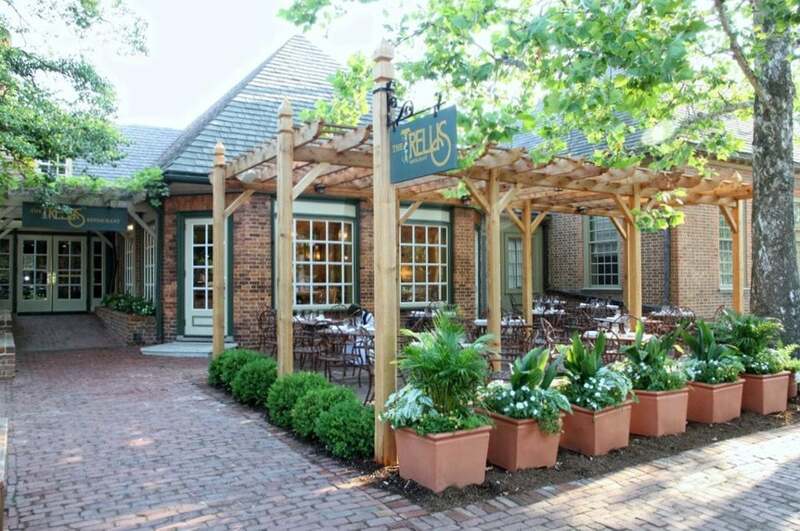 Colonial Williamsburg has four historic taverns that carry on the traditions of 18th Century dining. Costumed servers will engage you in an atmosphere of hospitality and merriment, further enhancing your Williamsburg experience. Shields Tavern serves Southern comfort foods inspired by colonial recipes. 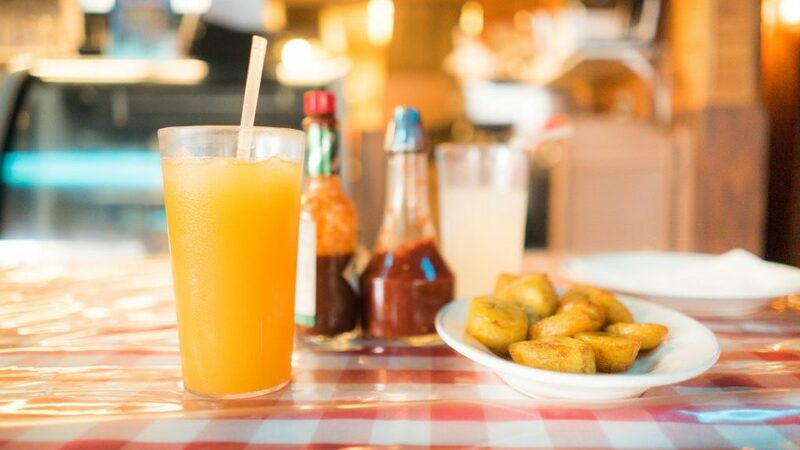 Try the tangy Carolina-style barbecue sandwich or the briny crawfish and shrimp stew. The fortified beverage of choice is the British mainstay Pimm’s Cup, a potent combo of Pimm’s No. 1, ginger ale and fresh cucumber. 2. The staff is dressed in contemporary garb at The Trellis. 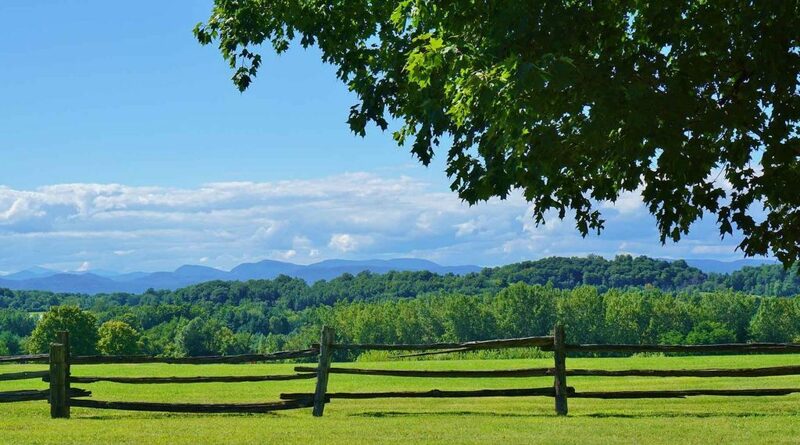 The sophisticated American menu highlights responsibly raised regional products from small-scale farms. Expect the menu to change with the seasons, but you will always find their famed dessert, Death by Chocolate. Billed as a study in chocolate, it combines a seven-layer cake, chocolate truffles, chocolate ice cream and chocolate sauce in a mind-blowing way. 3. If you are looking to picnic on the grounds of William and Mary, The Cheese Shop on Duke of Gloucester Street is where you will find provisions. 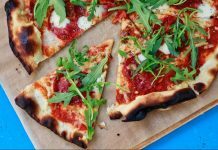 They showcase artisan cheeses and charcuterie. Homemade bread and salads round out the offerings. The following Colonial Williamsburg Foundation properties offer overnight guests many perks, including discounted Colonial Williamsburg tickets and on-site bike rentals. 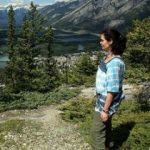 They are all members of Virginia Green Lodging, which recognizes hotels that have taken serious steps to reduce their environmental impact. The following lodgings place you in or walking distance from the Historic Area. 1. If renting an 18th century costume doesn’t quite satiate your pre-Revolutionary cravings, you can spend the night in one of 26 renovated or rebuilt houses that are scattered throughout the district. Antique-filled rooms and costumed staff are coupled with modern necessities like air conditioning, televisions and coffee makers. Many configurations are available, from a single to a 16-room house. 2. 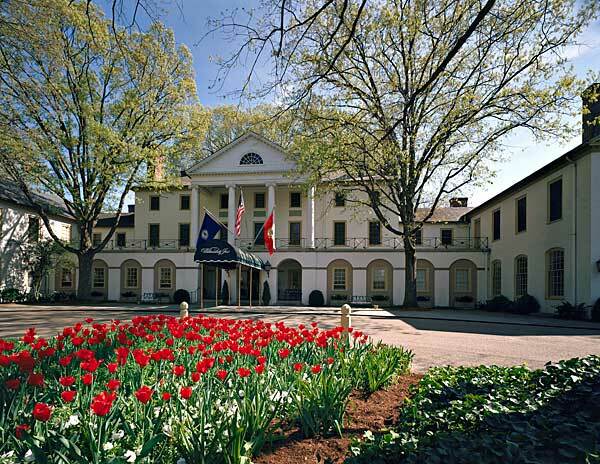 The Williamsburg Inn has housed Queen Elizabeth II (twice) and scores of other celebs and dignitaries. Step into its formal lobby and you are immediately ensconced in elegance and grandeur. Rooms are all exquisitely furnished. 3. If you’re looking for an economical place to stay, check into the Governor’s Inn. Its large outdoor pool, free continental breakfast and spacious, motel-style rooms make this the perfect choice for families. Directions: Amtrak’s Northeast Regional from Penn Station to Williamsburg in seven hours. The station is in the center of town, minutes walk from the Historic Area and resort properties. Photos: Corvair Owner, Mobilus In Mobili, College of William and Mary, Williamsburg Inn, Jamestown Settlement, Colonial Williamsburg Foundation, Williamsburg, Va.